Breckagh Bridge was Camp 11 of the sixteen established sites for evacuees from Gibraltar, who came to live in Northern Ireland during the summer of 1944. In July 1944, thousands of evacuees from Gibraltar arrived in Northern Ireland. They had left their homeland as requested by the British government and come to Co. Antrim, Co. Down, and Co. Londonderry to escape the Nazi bombing of London. Breckagh Bridge (Camp 11) stood on the Buckna Road, Broughshane, Co. Antrim. Like most of the displacement camps, it consisted of one Nissen hut per family. Larger huts made up a kitchen, a school, and a community centre. Maureen Fee from Tempo, Co. Fermanagh taught in the school. 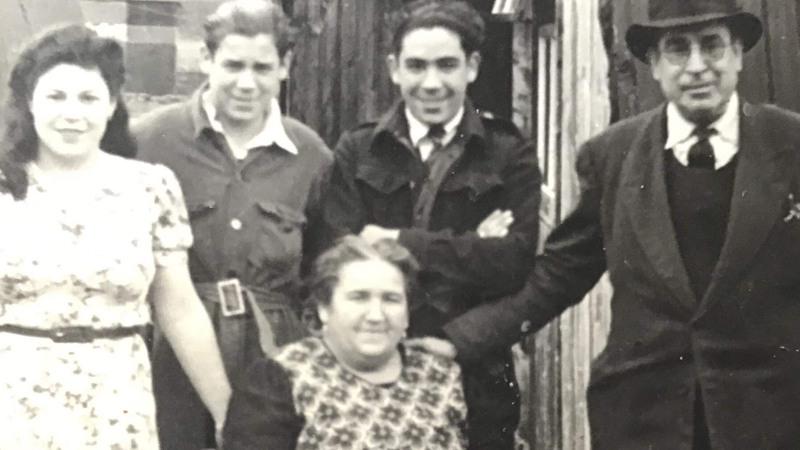 Family archive photo: Alfred Dalmedo, an evacuee from Gibraltar with other residents of Camp 11, Breckagh Bridge, Aughafatten, Co. Antrim. Photo supplied by John Dalmedo, son of Alfred and Sarah (née Crilly). Some of the evacuees from Gibraltar who lived in the Breckagh Bridge Camp, Broughshane, Co. Antrim. If you have any further information on these people, please let us know. Lara Ernest Lived at 12 Willis’ Road, Gibraltar. Left on 9th October 1940. Member of the concert organising committee. Later married Angela Sene. Sene Rogelio Lived at 11 Lower Castle Road, Gibraltar. Left on 28th July 1940 on the City of Evansville (Ship K) as part of contingent 4UK. Husband of Isabel Sene and father of Angela Sene. Sene Isabel Lived at 11 Lower Castle Road, Gibraltar. Left on 28th July 1940 on the City of Evansville (Ship K) as part of contingent 4UK. Wife of Rogelio Sene and mother of Angela Sene. Sene Angela Lived at 11 Lower Castle Road, Gibraltar. Left on 28th July 1940 on the City of Evansville (Ship K) as part of contingent 4UK. Daughter of Rogelio Sene and Isabel Sene. Later married Ernest Lara. Gomez John L Lived at 8 Crutchett’s Ramp, Gibraltar. Left on 30th July 1940 on the Swinburne (Ship L) as part of contingent 4UK. Member of the concert organising committee. Performer at concert. Perez Carlos Member of the concert organising committee. Estella Thomas Lived at 15 Lynch’s Lane, Gibraltar. Left on 26th July 1940 on the Athlone Castle (Ship D) as part of contingent 4UK. Member of the concert organising committee. Gomez Miss C Performer at concert. Rodriguez Mr J Performer at concert. Olivero Josefa Lived at Rosia Steps, Gibraltar. Left on 29th July 1940 on the Belgravian (Ship R) as part of contingent 4UK. Performer at concert. Ferrari Lourdes Lived at 14 Road to the Lines, Gibraltar. Left on 6th June 1940. Performer at concert. Ferrari Juana Lived at 14 Road to the Lines, Gibraltar. Left on 6th June 1940. Performer at concert. Suarez Luis Lived at 8 Bruce’s Gully, Gibraltar. Left on 21st July 1940 on the Clan McBean (Ship C) as part of contingent 4UK. Performer at concert. Vinales Henry Lived at 12 Morello’s Ramp, Gibraltar. Left on 30th July 1940 on the Swinburne (Ship L) as part of contingent 4UK. Performer at concert. Reyes Manuel Lived at 7 Johnston’s Passage, Gibraltar. Left on 30th July 1940 on the City of Windsor (Ship P) as part of contingent 4UK. Performer at concert. Reyes Mrs Lived at 7 Johnston’s Passage, Gibraltar. Left on 30th July 1940 on the City of Windsor (Ship P) as part of contingent 4UK. Performer at concert. Vinales Gloria Lived at 12 Morello’s Ramp, Gibraltar. Left on 30th July 1940 on the Swinburne (Ship L) as part of contingent 4UK. Performer at concert. Garcia Miss C Performer at concert. Vinales Teresa Lived at 12 Morello’s Ramp, Gibraltar. Left on 30th July 1940 on the Swinburne (Ship L) as part of contingent 4UK. Performer at concert. Gomez Eulalia Lived at 8 Crutchett’s Ramp, Gibraltar. Left on 30th July 1940 on the Swinburne (Ship L) as part of contingent 4UK. Performer at concert. Vinales Bianca Lived at 12 Morello’s Ramp, Gibraltar. Left on 30th July 1940 on the Swinburne (Ship L) as part of contingent 4UK. Performer at concert. Vinales Mercedes Lived at 12 Morello’s Ramp, Gibraltar. Left on 30th July 1940 on the Swinburne (Ship L) as part of contingent 4UK. Performer at concert. Dalmedo Alfredo Lived at 17 Castle Street, Gibraltar. Left on 19th August 1940 on the Neuralia. 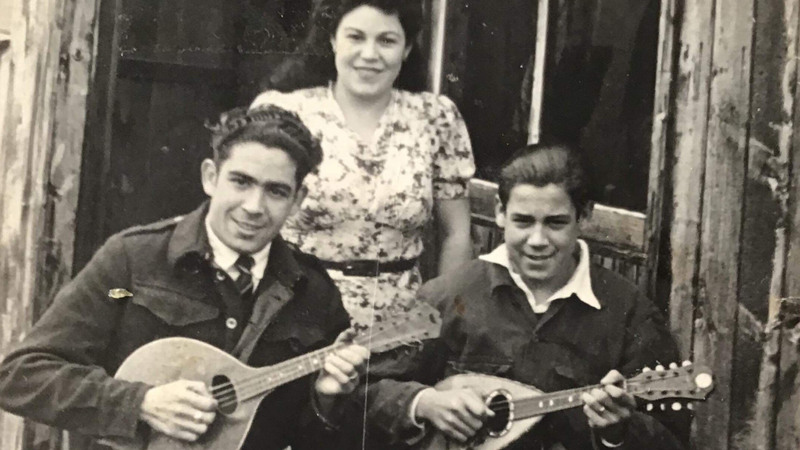 Family archive photo: Alfred Dalmedo, an evacuee from Gibraltar is a member of a musical group performing at Camp 11, Breckagh Bridge, Aughafatten, Co. Antrim. Photo supplied by John Dalmedo, son of Alfred and Sarah (née Crilly). On 23rd February, the Ballymena Weekly Telegraph reported on a concert staged at Breckagh Bridge. The organising committee consisted of Mr. John Gomez, Mr. Carlos Perez, Mr. Thomas Estella, and Mr. Ernest Lara. Mr. Harry Pearce provided the voice for a theatrical piece, ‘BBC Broadcast to Gibraltar’. Mr. JL Gomez provided musical accompaniment throughout the evening. Miss C Gomez sang a rhumba song while 8 girls danced. Mr. J Rodriguez sang a Spanish tango ‘El Pericon’. Misses Josefa Olivero, Lourdes and Juana Ferrari sang ‘I Wonder Why’ and danced the Argentine pasodoble. Mr. Louis Suarez sang ‘Espada Trium’. Eight girls performed the action song ‘The Bells are Ringing’. Mr. H Vinales performed a tango. Mr. Harry Pearce and Mr. J Gomez performed ‘The Great Illusion’ inspired by the magic of Jasper Maskelyne. Eight girls performed an eight-hand reel taught by Miss Shiela Hughes. A cast performed a theatrical short, ‘Public Bench’. Mr. Manuel Reyes, Mrs. Reyes, and Mr. Louis Suarez sang from the Spanish operetta ‘Alegria de la Huerta’. Miss G Vinales and Miss C Garcia performed a Hungarian dance. Miss T Vinales, Mr. Harry Pearce and Mr. H Vinales performed a comic sketch, ‘The Somnambulist’. Miss Eulalia Gomez and Mr. Louis Suarez sang a Spanish song with castanet accompaniment. Miss Eulalia Gomez and Miss R Vinales performed Schubert’s ‘Serenade’ as an accordion duet. Miss R Vinales, Miss M Vinales, and Miss T Vinales sang ‘Three Little Sisters’. The Breckagh Belles danced an Irish Reel. Mr. Manuel Reyes performed ‘El Sembrador’. 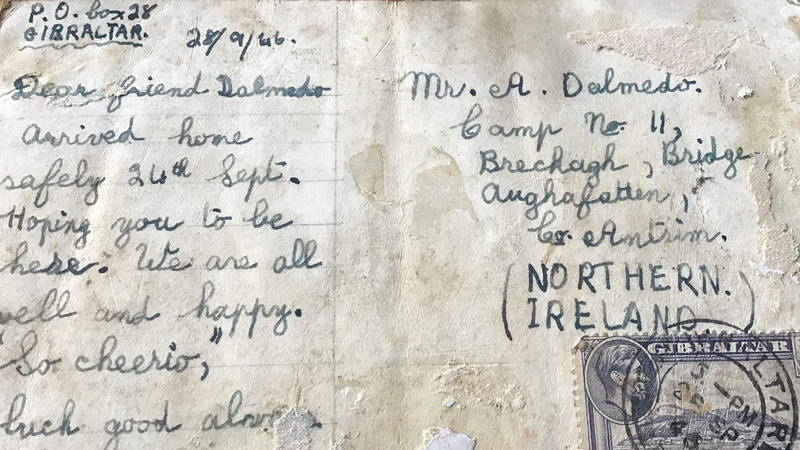 Family archive photo: A letter from "Charlie" in Gibraltar to his old friend Alfred Dalmedo who remained in Northern Ireland in 1946 at Camp 11, Breckagh Bridge, Aughafatten, Co. Antrim. Photo supplied by John Dalmedo, son of Alfred and Sarah (née Crilly). Father Dominic McHugh served as Chaplain to the Broughshane evacuee camps. Early on a Sunday he would say Mass in Dunaird. People from Drummuck also attended this service. The people of Breckagh Bridge would attend a later Mass service at Aughacully. Father McHugh attended the spiritual needs of all those on the camps. He also performed funerals and weddings. One of the first such weddings was at St. Patrick’s Church, The Braid, Ballymena on 25th April 1945. Ernesto Lara and Angela Sene from Breckagh Bridge became husband and wife. July 1998 marked the 50th anniversary of the official withdrawal and return to Gibraltar of the evacuees. To mark the occasion, Ballymena Borough Council erected a plaque where the Breckagh Bridge camp once stood. If you enjoyed this post on "Breckagh Bridge Camp, Broughshane, Co. Antrim", please share with your friends and followers.